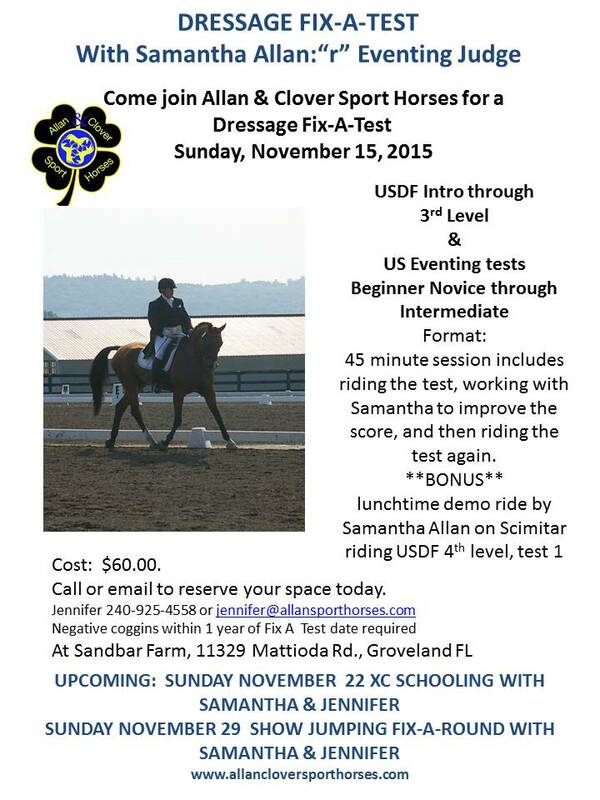 We are having a Fix A Test at Sandbar Farm in Groveland, FL on November 15th. If you are interested in attending, please let us know. It is free to Audit so please feel welcome to come over and meet us. We are happy to announce that Sam has been chosen as one of the judges to judge both the East and West Coast USEA Future Event Horse Championships this year!! I hope that you have all had a lovely holiday! Is improving jumping skills for you and/or your horse on your list for 2011? If so, this is your chance to get working toward that goal right away. The ever wonderful and talented 4* event rider Sharon White will be coming to Allan Sport Horses on Saturday January 8th for a jumping clinic. Many of you know Sharon and her reputation for delivering positive, informative, and challenging yet fun instruction. She happily teaches all levels of horses and riders, and has a knack for instilling confidence in both horse and rider. You can learn more about Sharon at http://www.lastfrontierfarm.com. You can learn more about Allan Sport Horses at http://www.allansporthorses.com. Please let me know if you would like to reserve a space for this Saturday as soon as possible. Please let me know your level and that of your horse when signing up so I can make appropriate groups. Spaces are limited! They are here again! Back by popular demand are our Winter Gymnastics Clinics at Allan & Clover Sport Horses. Come and join us on Saturday December 11th for a gymnastics clinic with Jennifer Clover. Work on your balance, position, and feel while helping your horses to sharpen their jumping skills at the same time. Levels from beginner through advanced accepted. Students will be put in groups according to level. Cost is $45 per person payable to Jennifer Clover.